A new market study by VDC Research on the global process level measurement market finds that the top five suppliers of process level measurement devices world-wide are: Endress+Hauser, Emerson Process Management, VEGA Grieshaber, Yokogawa Electric Company, and Siemens Milltronics Process Instruments. Emerson Process Management and Siemens lead the way in shipments of the two largest product categories - hydrostatic devices and sonic/ultrasonic devices. "While these five suppliers of process level measurement devices have the lion's share of the market, it is critical to remember that this market is highly fragmented, with dozens of other segment leaders operating in very specific technical or installation environment niches," indicated Chris Rezendez, Executive Vice President of VDC Research Group. The study, which forecasts the market through 2013 also found that: the global market for process level measurement sensors is expected to decline by nearly 15 per cent in 2009 but will begin to grow in late 2010 or the first half of 2011; increased efficiency demands and regulatory compliance drivers are the top factors driving long term growth; the greatest gains in shares are seen in Foundation Fieldbus as the standard is becoming more widely accepted; emerging wireless standards are expected to make inroads into the global market over the forecast period; and worldwide, the verticals exhibiting the strongest now- and near-term performance are chemical/specialty chemical markets, petrochem and pharmaceutical. Emerson Process Management has demonstrated its ongoing commitment to level measurement with the new Rosemount 5300 guided wave radar (GWR) level transmitters for SIL2 safety instrumented systems. Following successful third-party evaluation, the 5300 series now comes with the required failure modes, effects and diagnostic analysis (FMEDA) report. As a result, says Emerson, companies in the oil and gas production, refining, petrochemical, chemical and power industries can benefit from the superior performance of GWR technology while ensuring compliance with associated IEC industry standards. The 5300 Series was evaluated, as per hardware assessment IEC 61508, by global organisation Exida. The resulting FMEDA report, with safe failure fraction (SFF) over 90 per cent, shows SIL2 suitability. As per IEC 61508 and IEC 61511 the documentation provides safety instrumentation engineers with the required failure data and with proof test recommendations. With a five-year-plus proof test interval, the proof test can be co-ordinated with plant turnaround, minimising process interruption and reducing risk to personnel. 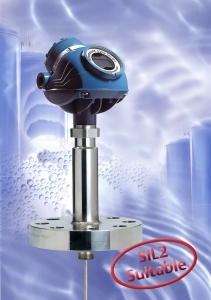 The Rosemount 5300 series is a two-wire GWR for challenging level and interface measurements on liquids, slurries and solids. It leverages the company's 30 years of radar expertise and is designed to improve plant profitability through superior reliability, state-of-the-art safety features, effortless handling and unlimited connectivity. It has an enhanced capability to handle disturbing factors, longer measuring range, and lower dielectrics, even with a single probe. The robust design prevents leakage and performs reliably, especially under extreme process conditions. Heavy-duty probes are available to meet the extreme temperatures and pressure challenges with multiple layer of protection and advanced echo logics for reliable overfill detection. The 5300 series' two-wire technology enables fast and inexpensive installation. With user-friendly graphical interfaces and wizards, measure-and-learn functionality, suggestions for application-specific configuration and PlantWeb digital architecture functionality, the transmitter integrates easily into new or existing control systems. This, in addition to maintenance-free operation and advanced diagnostics, results in a quicker return on investment with overall improved uptime and enhanced safety. VEGA Grieshaber continues its efforts in the same market with an order encompassing the complete level, switching and pressure instrumentation for Germany's largest paper mill. Production start-up in the new paper mill is planned for March 2010. The order includes, among other things, VEGABAR pressure transmitters with ceramic CERTEC measuring cell, various types of VEGAPULS radar sensors as well as VEGACAP and VEGASWING level switches. The instruments will be used in all areas of the new plant - from stock preparation to paper machine. The new paper machine has a working breadth of 10.1 m and an operating speed of 1900 metres/minute. Every year, 650000 tons of test liner and corrugated medium are to be produced from 100 per cent recycled fibres in weights from 70-130 g/m2. In another new move, BASF and VEGA Grieshaber have extended the existing framework contract. The contract covers the worldwide delivery of level and switching instrumentation from VEGA for the manufacturing locations of the BASF Group. According to VEGA, this contract underscores and deepens the trust as well as the successful cooperation between the two companies.